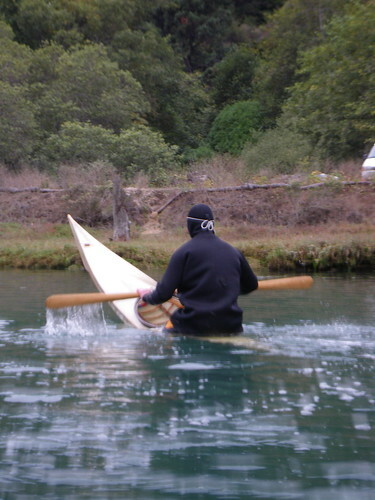 In early October, I traveled south to Mendocino, CA to attend the Traditional Arctic Kayaking Symposium. I had never been to this one, since it is usually held much further south, in San Simeon. 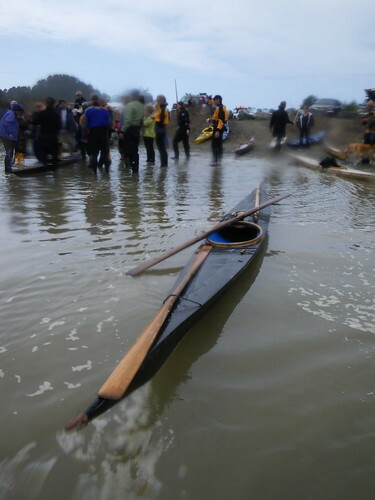 Initially, I was not planning on attending this one either; it has been a busy year of travelling around and attending kayaking symposiums, and I was thinking I would just stay closer to home that weekend. But when I realized that Maligiaq Padilla, seven time Greenland national champion would be there, along with Cheri Perry and her partner Turner Wilson, I decided that if there was any year to travel south to this event, this would be the year. Once I had promised to transport Cheri and Turner’s qajaqs from Ginni’s farm where they had been left in August, after the LoCo Roundup, then I was committed. I got down to Van Damme State Park Friday around noon and checked in to my campsite, but due to some unforseen circumstances, there were a number of venue glitches. There was a abalone divers’ convention at Van Damme park where TAKS was supposed to be held, so most of the TAKS folks ended up camping at another campsite down the road. It took a while to find everyone, and I finally ran across them at Big River, which turned out to be a great site for almost everything. 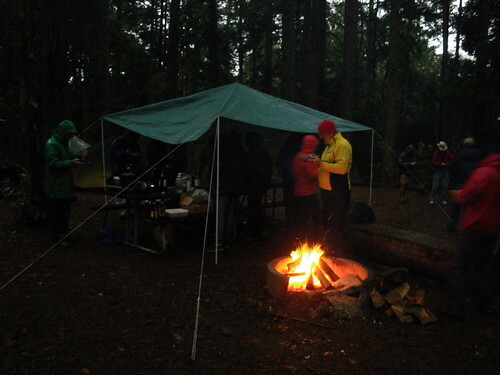 A potluck dinner was planned for that evening at the new campsite. 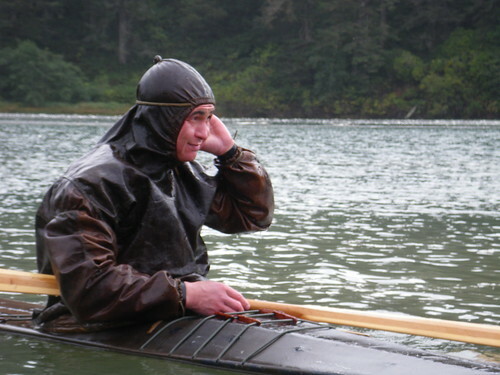 A drysuit would have been the perfect attire, since it literally poured down rain for most of the evening. The next day was rolling instruction, strokes instruction and a coastal paddle trip. I would have liked to go along on the coastal trip, but what I really wanted was to get some rolling coaching. Usually I am teaching at symposiums, and never have a chance to actually get any coaching for myself. I spent the morning in Turner’s qajaq, working on norsaq and hand rolls with Helen and Maligiaq. I had developed some bad habits that I wanted to get rid of. In the afternoon I got back in Turner’s qajaq again and worked with Cheri on improving my storm roll. 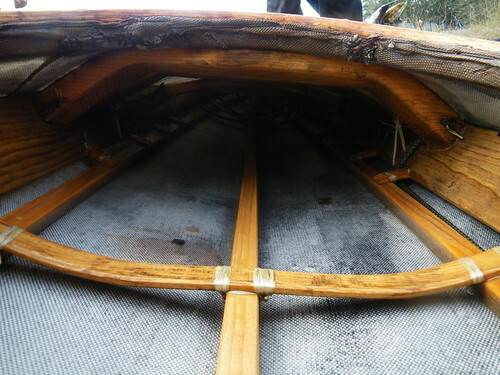 Rolling in a tight fitting Greenland style qajaq is pretty different from rolling a conventional manufactured kayak. I realized how inflexible I really am! One big treat on Saturday was watching Maligiaq go through the rolling list in Cheri’s “cheater” rolling qajaq. He makes it look so easy! And not only that, but he brought a real sealskin tuiliq with him from Greenland. It is a thing of beauty, and smells wonderful, at least to my nose. I’m sure others might disagree. 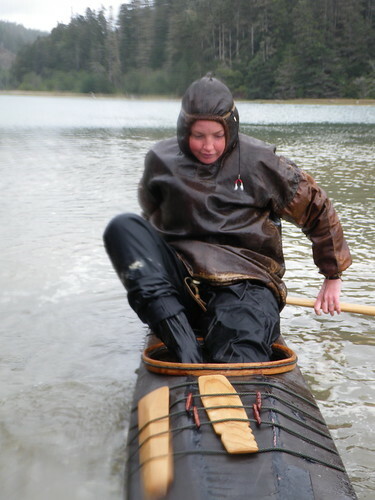 Helen got to try on the tuiliq with the cheater qajaq for awhile as well. 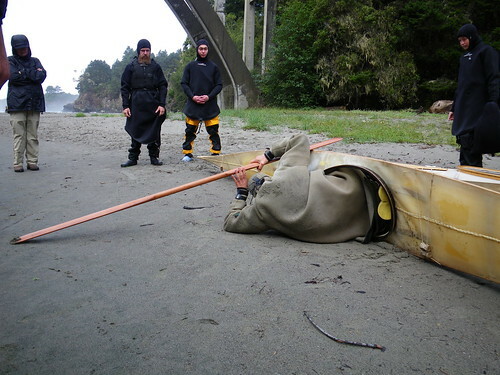 Here’s a couple of video clips of Maligiaq rolling. Here’s one of Helen rolling Cheri’s qajaq and wearing the sealskin tuiliq. Turner and Cheri’s qajaqs attracted a lot of attention. 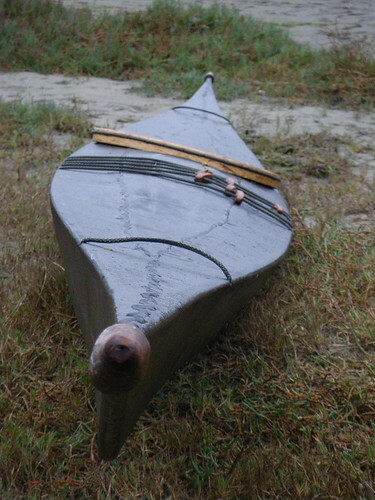 Cheri’s qajaq was built as a close copy of a competition rolling qajaq that Maligiaq had built years before. There are a lot of details about this qajaq that are interesting to builders and competition rolling afficionados. 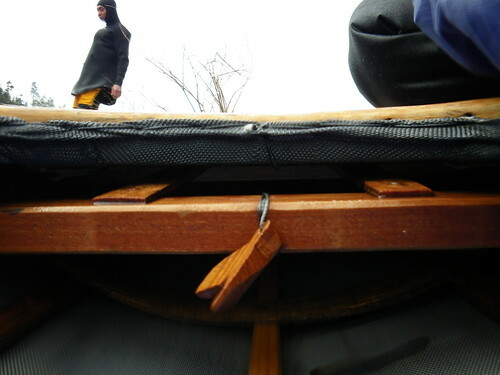 The “isserfik”, or the deck beam that supports the rear of the cockpit coaming, is fastened to the gunwales at the bottom, rather than the top, and the coaming “floats” with the skin, so that when you lean back, the coaming has some give to it, and gives you a little extra layback. The ribs from the seat area down past where your feet go were only partial ribs, not going all the way across the bottom of the qajaq, making it much easier to slide your feet into. 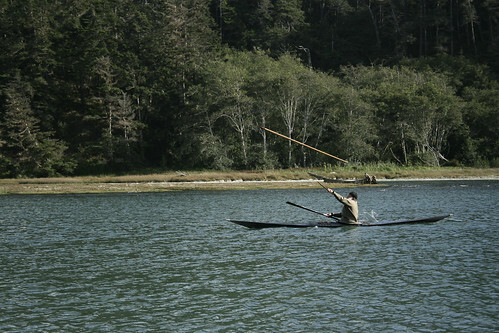 This would not be a strong enough construction technique for a general purpose qajaq, though. No Greenland qajaq symposium would be complete without a ropes setup for qajaasaarneq moves. 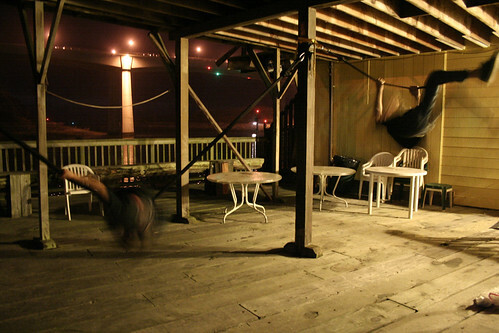 Dubside did a ropes demo in the parking lot at Big River, and then the kids climbed on to play, too. Saturday night we all went into Fort Bragg for a nice dinner, and while we were waiting for them to be ready for our huge group, the qajaasaarneq ropes got setup again next to the restaurant and Dubside and some kids were at it again. Sunday morning there weren’t very many people willing to get wet, I guess, and there were only a few of us on the water. Cheri, Turner, Dubside and Maligiaq were out goofing around and helping a few of us work on rolls. While Helen was getting world class coaching for the under-the-hull sculling roll, Cheri was helping me work out the front deck sculling roll, which I had never gotten before. I did manage to hit it once with Cheri’s coaching. Maligiaq showed us the new rolls that will be added to the list next year, and I was glad to see that I already knew how to do one of them and quickly figured out one of the others. 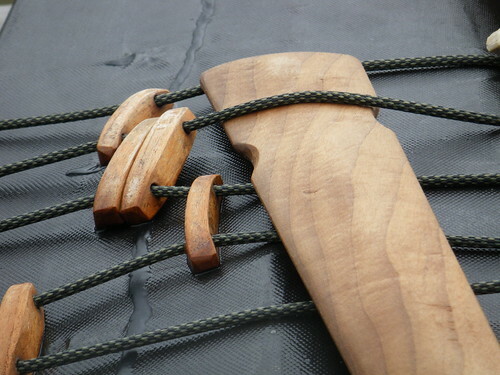 We also dragged out the harpoon to play with, and I asked Maligiaq to look at my harpoon setup and critique it. Much to my surprise, a few of the key measurements were actually right where they were supposed to be. I don’t know if I will make it all the way down to San Simeon next fall for TAKS, but if it ever comes back up north again, I will be there for sure. My little guy and I were reading your blog. 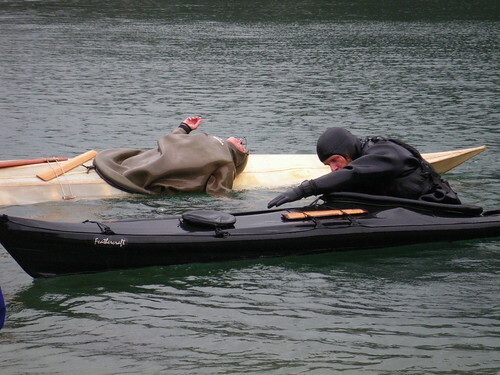 He was awed by the sealskin clothing. He picked up that it was special without me saying a thing! 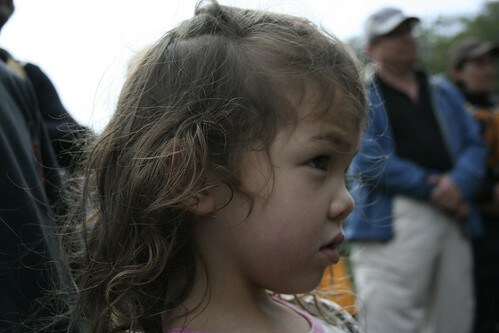 We both loved the photo of the little girl. 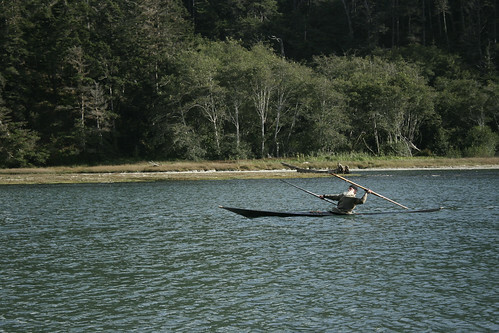 I’ve only done a bit of kayaking but I enjoy living vicariously through this blog.